The follaein leet o Israeli ceeties is based on the current index o the Israel Central Bureau o Statistics (CBS). 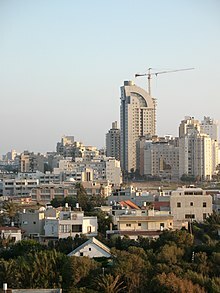 Athin Israel's seestem o local govrenment, an urban municipality can be grantit a ceety cooncil bi the Israeli Interior Meenistry when its population exceeds 20,000. The term "ceety" daes no generally refer tae local cooncils or urban agglomerations, even tho a defined ceety aften contains anerlie a sma portion o an urban aurie or metropolitan aurie's population. Israel haes 14 ceeties wi populations ower 100,000, includin Jerusalem at ower a 500,000, an Tel Aviv, which is considered tae be approachin global ceety status. In aw, thare are 75 Israeli municipalities grantit "ceety" status bi the Meenistry o the Interior, the maist recent addition bein the Arab Israeli dounset o Kafr Qasim. ^ al: The town of El'ad grew from 5,800 residents in 2000 to 25,500 in 2005, a growth of 339.7%. 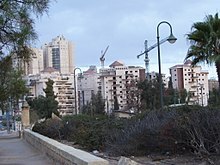 Similarly, Modi'in Illit grew from 16,400 residents to 30,500, an 86% growth. They were however local councils as of 2005, and are therefore excluded from the list. ↑ "Structure of Local Government". Israel Ministry of Foreign Affairs. Retrieved 2008-04-11. ↑ "Inventory of World Cities". Globalization and World Cities Study Group & Network. Retrieved 2008-04-11. ↑ "Arab village of Kfar Kassem declared a city". Ynetnews. Retrieved 2008-04-11. ↑ 4.0 4.1 "Table 3 - Population of Localities Numbering Above 2,000 Residents and Other Rural Population" (PDF). Israel Central Bureau of Statistics. 2010-06-30. Retrieved 2011-01-29. Cite error: <ref> tag with name "CBSestimate2005" defined in <references> is not used in prior text. This page wis last eeditit on 14 Februar 2018, at 23:50.